Guys, if you are expecting this Onion Soup as another version of French Soup, or other Western soups (Pumpkin Soup & Mixed Vegetable Soup) or even Chinese kinda soups (Vegetarian Chinese Winter Melon Soup), I think you will be disappointed. But trust me, you must actually, this my style, me coining the recipe, Indian style Onion Soup I bet will not let you down (Tomato Spinach Soup, Corn Soup & Mor Rasam). Basically, lemme repeat myself again. Me the Indian (Indian Crab Soup & Indian Mutton Meatball Soup) who didn't know what to cook for our dinner and then, out of somewhere or out of the blues, came flying this idea. How about spices, butter, vegetable stock, turmeric powder (Turmeric Tomato Soup) and onion? All of these ingredients for this Onion Soup. A pat on my shoulders. I must. Onion Soup turned out as expected. In fact, better than I thought it will be. Scented by coriander leaves and teamed alongside toast (Chicken Vegetable Soup). What say you? I bet it is tempting? Don't discount it. Make it and I bet you will love it. Heat butter and when heated, sweat onion to soften its texture. Add spices and continue to fry for another 1-2 mins. Pour in stock and simmer. Let the liquid reduce to about 1/3. 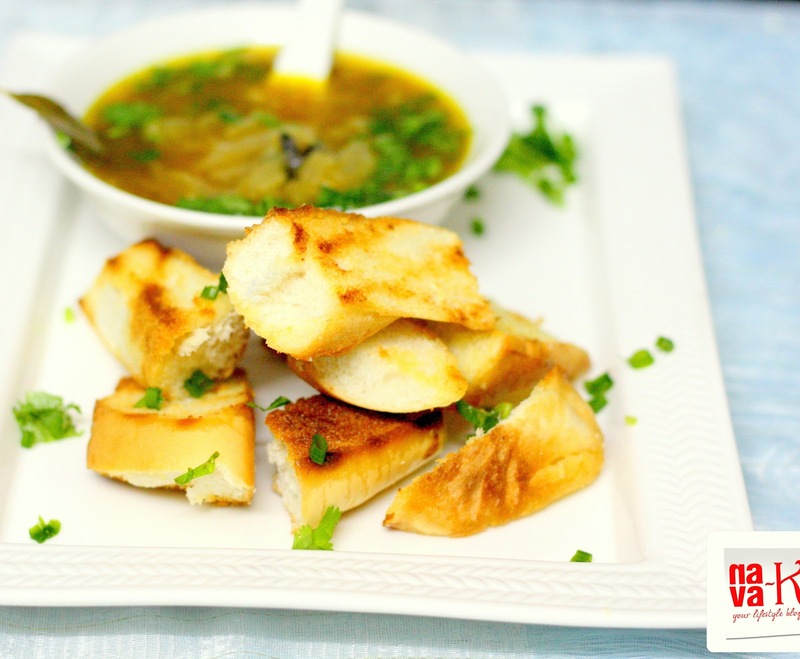 Remove from heat, garnish with coriander leaves and serve with grilled baguette slices. have heard of french onion soup. Indian onion soup is a first for me! Delicious soup. I love to have it now as my both nose is stuffed. 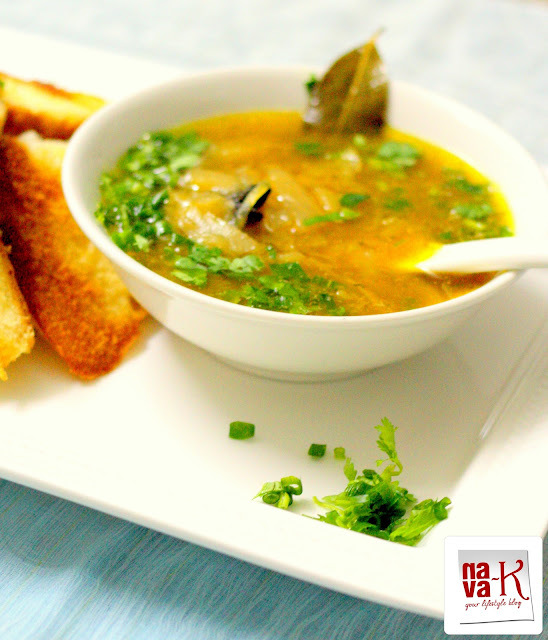 Nava, I have never tried or made onion soup but this is probably the easiest soup I can try now. It sound delicious to dip the bread and eat hot soup on such rainy weather. Hate to be a nay-sayer, but we tried it last night and it was not a big success. It was destined for the trash can but spent the night in the pot, on the stove. I took a little taste this morning and, surprise, surprise, it was much better, maybe even good. It seemed as tho it had "mellowed," and the tumeric taste was much less intense. When I try it again, I will "age" the soup before eating, and also try something other than the vegetable stock ... maybe diluted chicken stock. I will also look for some additional Indian seasons to add to this. But, its a good idea, and may be to our liking when we muck around with it a little. I am shocked to read your comments. My friends made the soup and they were very pleased with the taste. Wonder what went wrong when you made the same. Well, you can try with chicken stock, nothing is wrong with that. Could it be the type of turmeric powder you used? I have been adding turmeric for many of the different types of soup I made and we loved the flavor. Thanks for your feedback anyway.